It's nice to actually have cause for an update. I had a very productive weekend. It felt good. 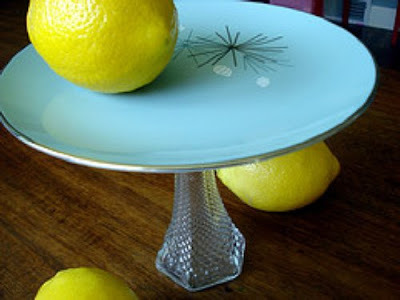 Cake stand from Design*Sponge. Made this awhile ago, but I haven't been able to get a decent photo. This is a tricky little bugger. Think the lemons helped. Embroidered drawing, inspiration from The Creative Family by Amanda Soule. The embroidery on this one took considerably longer than the Kitty Wall Hanging. This one is set on some decorative paper and then inserted in a clip frame. 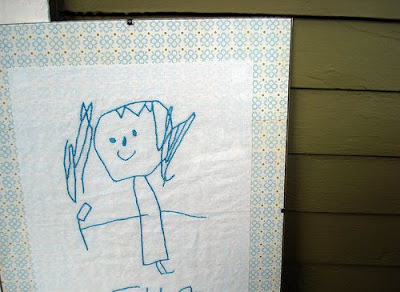 See the original drawing here. Skirt with fabric from Marf who was de-stashing, consequently I ended up "stashing." This is the first skirt I've ever sewn. Good thing you can't see it too closely. I've got plans for more! Everything is great! You have been BUSY! I am hoping to start a productive streak next week, but things keep coming up. 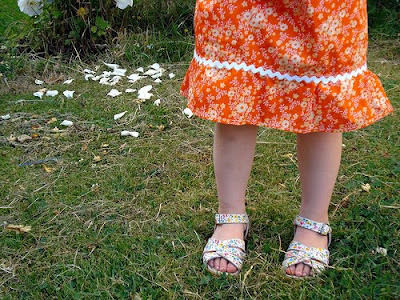 I'm thrilled to see that fabric put to such adorable use. I can't see rickrack without thinking of all the dresses my mom used to make for us. She made a red square dance dress for my sister, with blue rickrack. When I needed a dress for Cinco de Mayo, she replaced the blue with green. Voila!